We were joined at the event by Chad Schwitters and his wife who stopt off along their cross-country drive from Washington State. 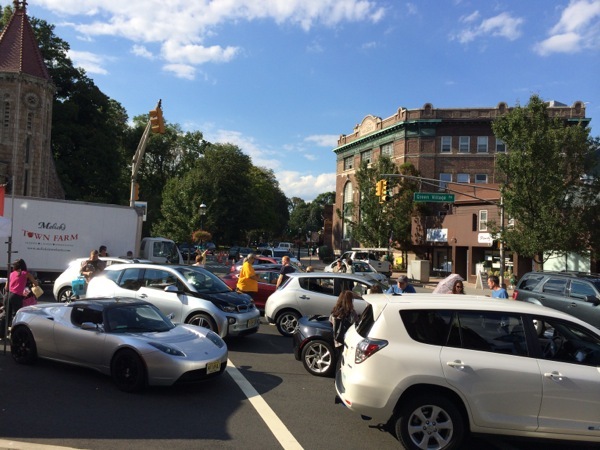 What: An Electric Vehicle Event hosted by the New Jersey Electric Auto Association (NJEAA). When: Thursday September 18th 2014, from 3:30pm - 6pm. Why: An opportunity to learn all about Electric Cars in one place. Learn how much fun they are to drive, how little they cost to run and why we all have a big smile on our faces when we drive them. Talk to owners about their experiences and maybe get the chance to take a ride in an Electric Car. We will have Tesla Model S, Tesla Roadster, BMW i3, Nissan Leaf, Zero Motorcycle, Rav4 EV and more. Registered attendees report 260,125 electric miles driven.